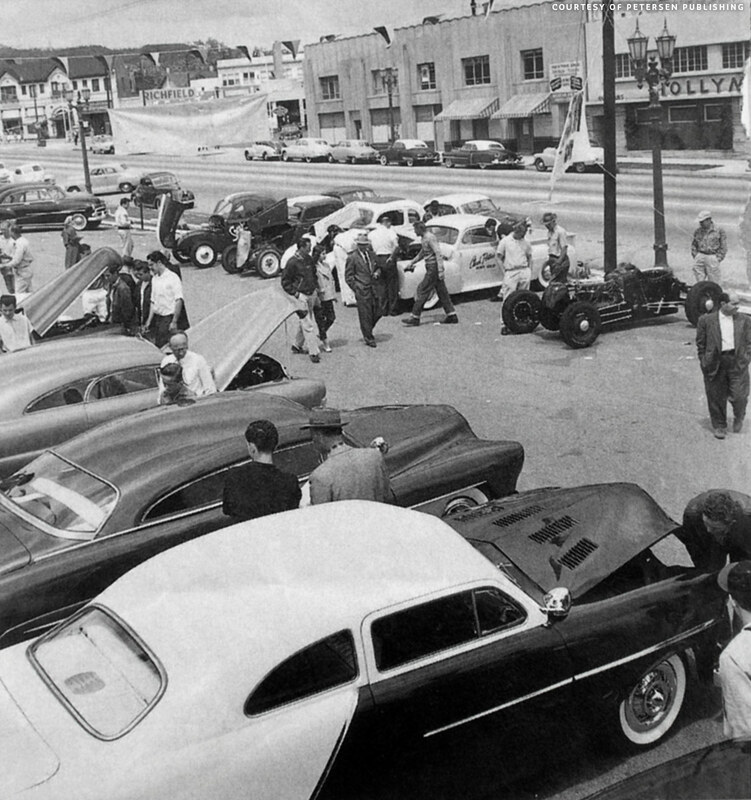 1955 Hot Rod and Custom Car show held at the new Thrifty Drug Store on Vermont Avenue in Los Angeles. 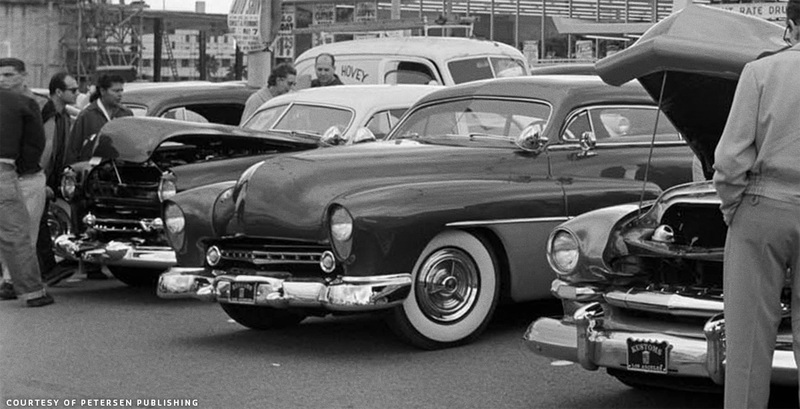 In the 1950’s it was very common to organize Hot Rod and Custom Car shows at the local parking lots large public facilities as drug stores, stadiums etc. The parking lots were huge easily accessible and it was easy to rope off a section for the show. 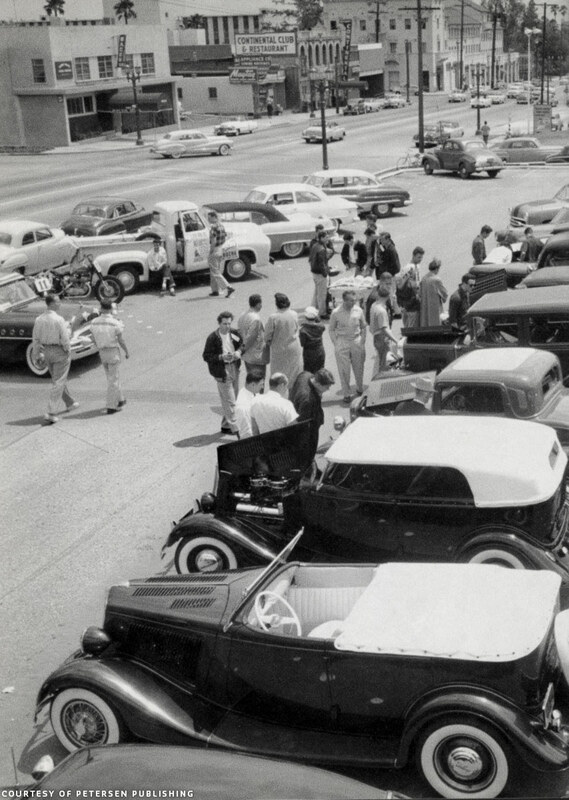 One of the most famous of these parking lot Shows was a show with high end custom cars held at an Los Angeles Thrifty Drug store in May 1954 which we covered in this CCC-Article. Since we did that article I have been collecting photos of outdoor parking lot car shows I came across to add to this what I hope to become a series on parking lot car show articles. Several early and mid 1950’s magazines had a few photos taken at these parking lot shows which I had not been able to identify until I came across an article on the Hot Rod Magazine Article featuring some really great photos taken by Rick Rickman. One photo in particular stood out to me. 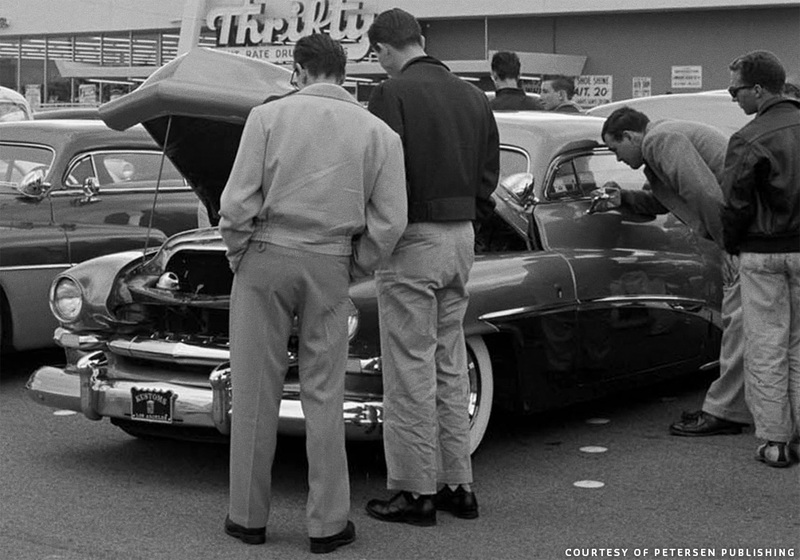 A picture taken at a Thrifty Drug store in May 1955 showing the Hirohata Mercury, in it later lime gold paint, Dave Bugarin’s 1951 Mercury and Bob Dofflow’s ’49 Ford. 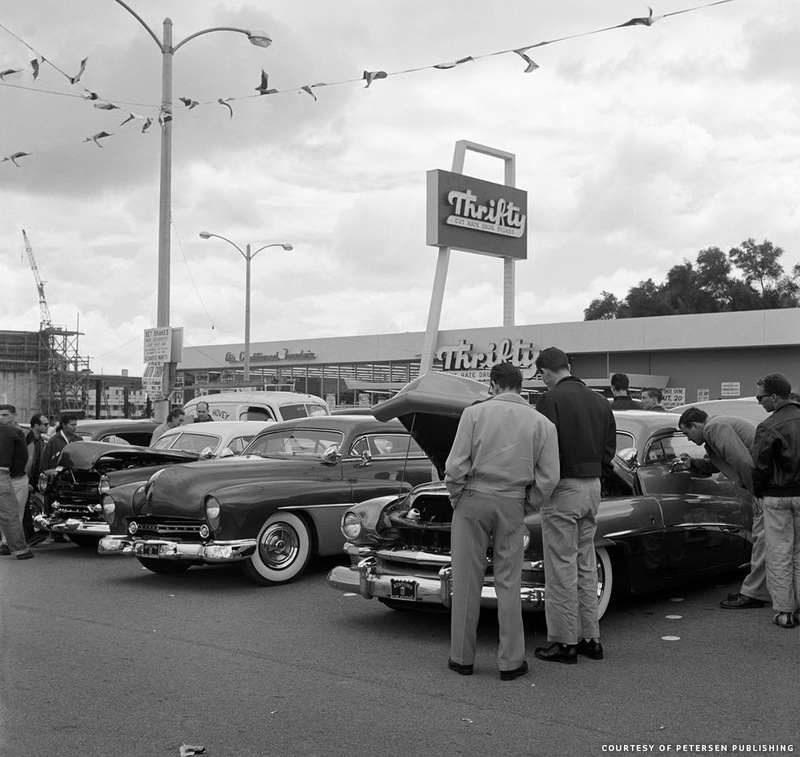 And while drooling over that photo I realized I had seen a few more photos taken at the same location, and now I was able to place them all at one May 5th, 1955 event held at the Thrifty Drug Store at the corner of Vermont Avenue and Hollywood Blvd. in Los Angeles. And, perhaps just as important. 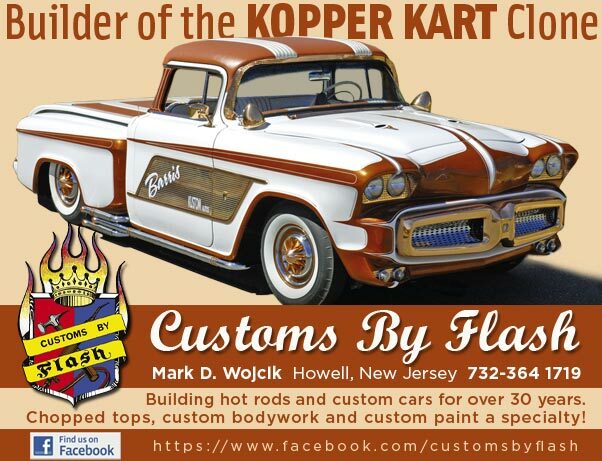 The photo caption from the Hot Rod magazine article explained why these car shows were held at the Thrifty Drug Show… and how it was possible that all these high end Custom Cars were at this and the 1954 show. This was taken at a show at a Thrifty drug store on May 5, 1955, at the corner of Vermont Avenue and Hollywood Blvd. From right to left we can see, Bob Hirohata’s 1951 Mercury with the new (after the Running Wild movie shoot) lime gold paint job, and door mounted mirror, Dave Bugarin’s 1951 Mercury (both by Barris), next to Dave’s Merc is Bob Dofflow’s ’49 Ford restyled by Bear Customs, and next to that we can see the top and a few other small details of what most likely is the 1948 Mercury of Cliff Rackohn (thanks Anthony White for identifying that one) Behind Bob’s Ford we can see a ’46 Chevy panel truck with roof rack, which was most likely used by Rick Rickman to make the overhead photos. Three rolls that Rickman logged into Petersen’s in-house lab on May 9, 1955, as “Thrifty Drug NHRA Show” mystified archive divers for decades. In our July 2010 issue, founding HRD editor David Freiburger published six pages of parking-lot pictures, including one showing NHRA’s third employee and Drag Safari organizer, Chic Cannon, with an L.A. sheriff’s deputy. Left unexplained were who organized the event, and why, and how a gathering of so many famous hot rods, race cars, sport specials, and especially customs apparently never made HRM or its sister magazines. In 2013, Cannon’s autobiography answered the first two questions: “Since I had some experience organizing car clubs, Wally gave me the position of [NHRA] National Club Advisor. 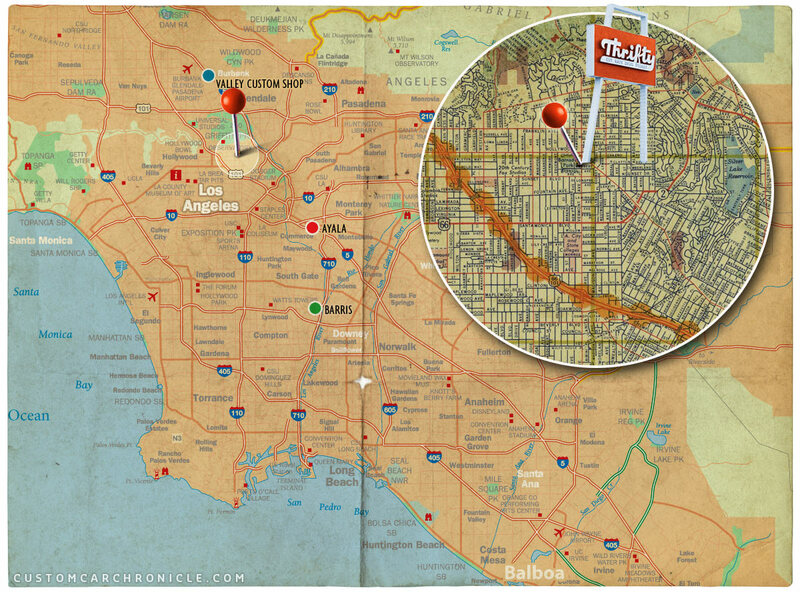 My cousin, Art Crawford, was in marketing … and had Thrifty Drug Stores as a client of his. They were developing new shopping centers all over Southern California, and Art asked me to help promote the grand openings…. 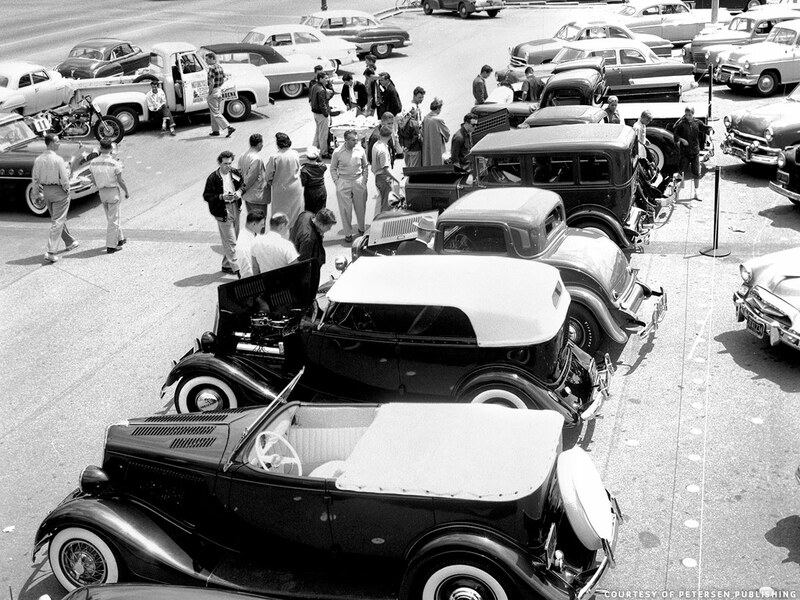 So in 1954 and ’55, I organized about a dozen car shows.” As for why at least two were thoroughly photographed on Petersen film but never made print, Chic’s insight leads us to suspect that Rick’s assignment came from NHRA president Wally Parks—not his HRM boss and editor, also named Wally Parks. Possibly the photo lab supplied sets of prints, only, to NHRA and/or Chic’s cousin for promotional purposes, while the negatives were filed, as usual, with the publishing company. Here’s a shot of the other side of the parking lot. possibly taken from the roof of the Hovey 1946 Chevy panel truck we can see in the top photo. In the foreground are Dave Bugarin’s ’51 Merc, next to the Hirohata Merc, and unidentified chopped padded top early 40’s Chevy and two more light colored customs I have not been able to identify. On the other sied are three drag cars including the Sparks & Bonny Willys and on the far right we can see the front of the pale yellow Chuck Porter truck. It is amazing to see that people could walk up to the car and even touch them. Taken from the same high location as the previous photo, but taken at a different angle shows Bob Dofflow’s ’49 Ford the best of all the known photos shared from this event. Also taken from the roof rack, but now facing the opposite direction from the photos shown earlier. This side of the parking lot had more of the Hot Rod entries. The only car I recognize is the ’34 Ford with the padded top which was owned by Earl Schieb or possibly his son, Al at the time. Created from the same negative as the photo above, but cropped different, showing more of the Vermont Ave.
Close up of the Hirohata Mercury which was at the 1955 show with the new lime gold and organic green below the Buick spear paint. The color was changed, because it needed to be updated after having been on the road for a few years, but also because a darker hue would show better on camera for the Running Wild movie. Most likely the Mercury was still owned by Bob Hirohata, but he did sell it in 1955. Notice both the hood and trunk are open, and the public can come very close to the cars, even touch it. The Dave Bugarin ’51 Mercury and Bob Dofflow’s ’49 Ford a bit more close up. It must have been an amazing sight to see these high quality, magazine featured and show award winning Customs lined up in the parking lot. 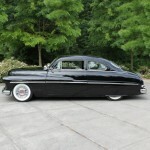 Many thanks to the Petersen Archive for sharing these amazing photos on the Hot Rod Magazine website. And hopefully many more from those 3 rolls of film that Rick Rickman took in 1955 of this event will be shared. 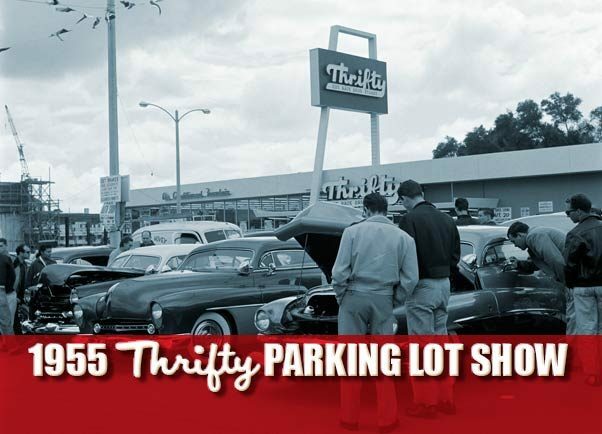 And hopefully more of the 1954 and perhaps any of the other events held at the Thrifty parking lot will be shared. With such top cars in attendance at these outdoor events it would make sense if many more photos were taken. By professional photographers, as well as by car owners and those who came to look at the cars at these free Custom Car Shows. 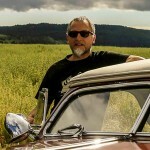 If any of our readers know about more photos from these events, or know more about the events themselves, please email Rik here at the Custom Car Chronicle. 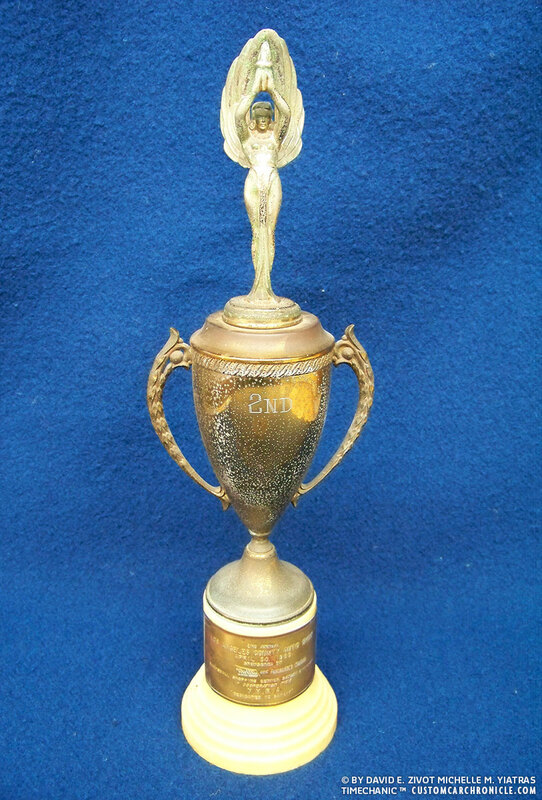 David Zivot send us two photo of a Trophy from his Personal Collection. was awarded to the 2nd Place winner at a Thrifty Drugs grand opening less than a week earlier than the show from this article. 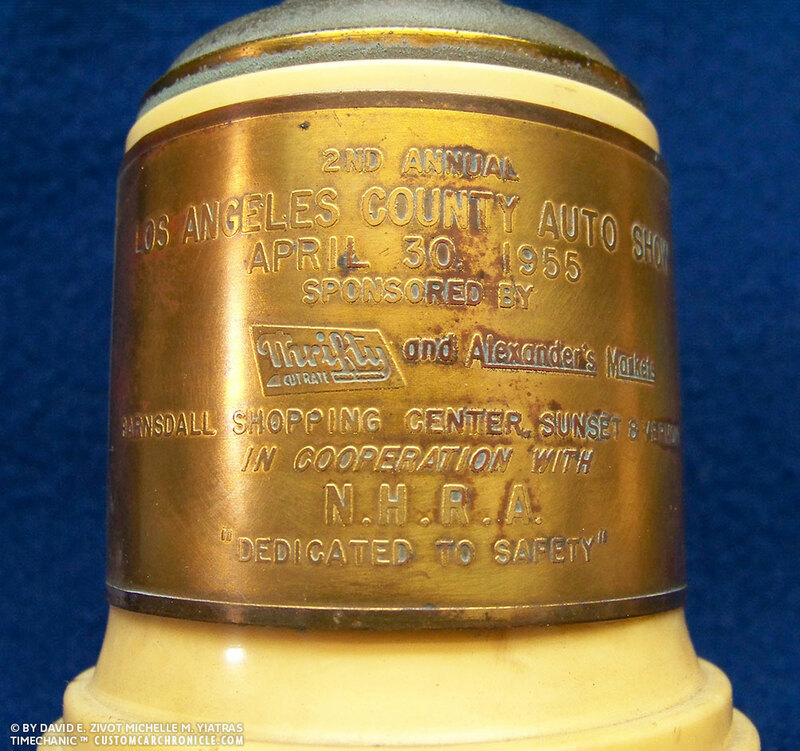 It appears that the Thrifty and Alexander’s Market sponsored show (in cooperation with the NHRA) was held one street over on Sunset & Vermont, at the Barnsdall Shopping Center. 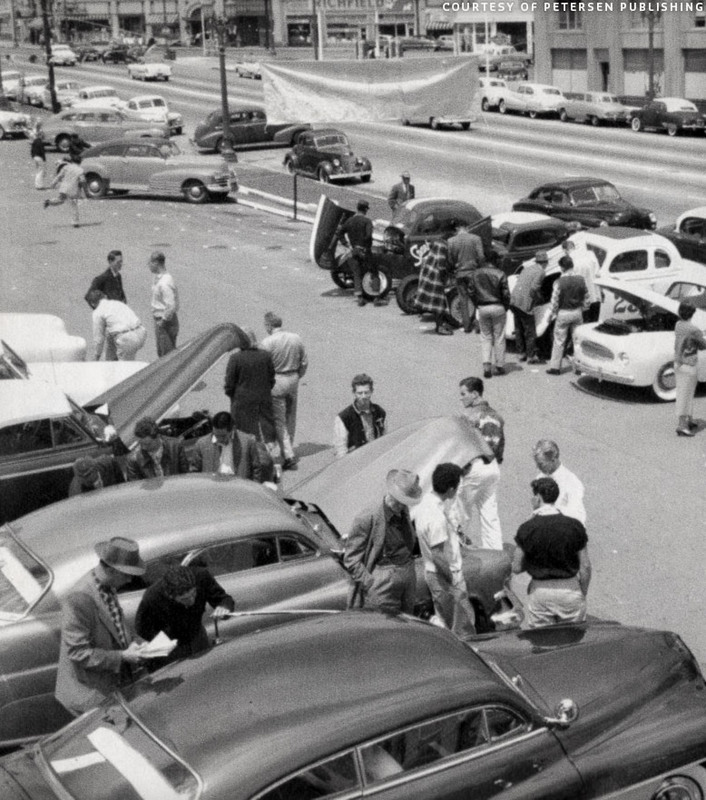 These photos, the awards and the notes from the Hot Rod Magazine article that there were a series of Car Show held at the Thrifty Drug Store parking lots across LA makes me really wonder how many of these shows were held in 1954-55. And how they were advertised. So far I have still not been able to find any announcement for these shows. Possibly announcements were made in the local news-paper, or perhaps posters were made that were distributed at the local hang-outs? Who knows more? 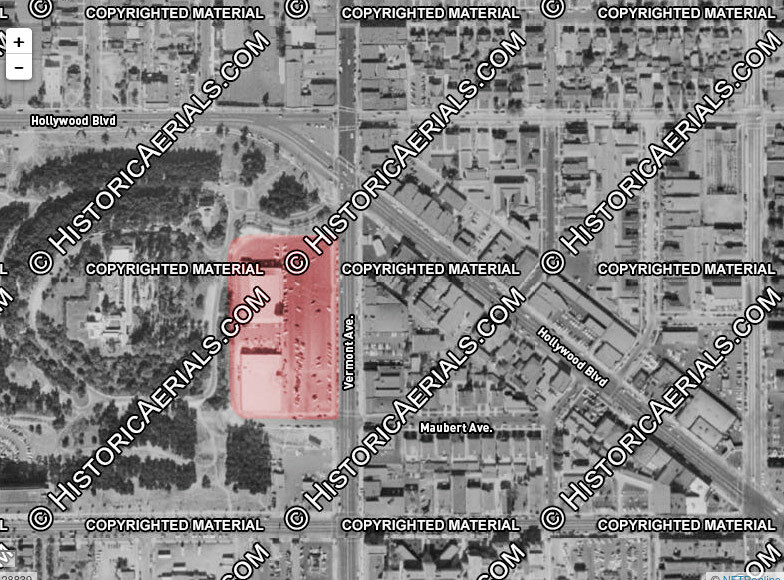 1954 aerial view showing the parking lot where the ’55 Car Show was held. What an awesome photo of the guys looking at the Hirohata Mercury…! I am sure there is more photos sitting some were in people photo albums…. Lots of the coolest and most iconic Southern California customs and hot rods grouped together for an outdoor show. What a show!